A roller-coaster ride on global markets, which saw some bourses record their largest one-week losses since 2008 as they took fright at a Chinese sell-off, have raised fresh worries over the strength of the global economy. And while analysts said fears of a repeat of the financial crises of 1997 or 2008 were largely unfounded - mainly because of reforms undertaken since they warned that continued turbulence emerging from China would take a toll on global economic growth, especially in emerging economies. 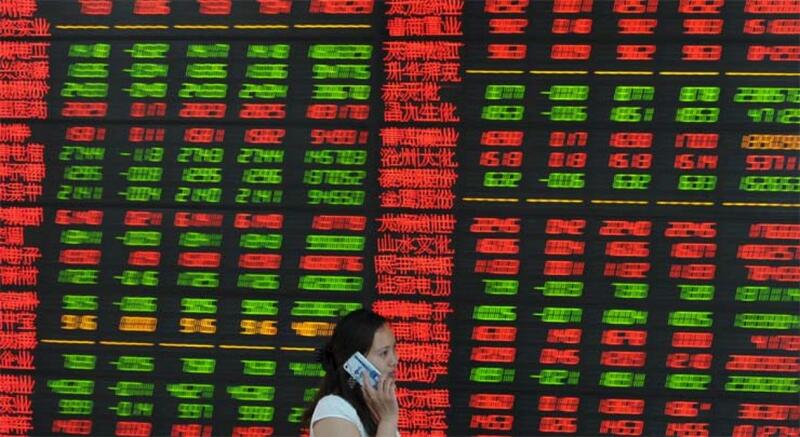 An 8.5 per cent plunge on Shanghai's benchmark index on Monday triggered sharp declines across the main US and European exchanges, with drops that wiped out any profits earned this year. The carnage was even worse in emerging economies, and while non-China stock markets recovered somewhat on Tuesday, comparisons have nevertheless been made to the 1997 financial crisis, which left East and Southeast Asian economies in tatters and some seeking bailouts from the International Monetary Fund. At that time, China was a rock of stability. This time, it is the source of the turmoil. Beijing's failed efforts to calm its own capital markets and stem the domestic economic slowdown were compounded by the unexpected devaluation of the yuan two weeks ago. Fears that the devaluation was a sign the country's economy was in even worse shape than feared though China is one of the fastest-growing economies in the world, gross domestic product expansion has slowed to around seven per cent, sparked a selloff. Most emerging economies followed, effectively triggering a bout of competitive devaluations. Worries that leaders in Beijing have not yet got a handle on the country's economic problems are only growing. "What we are facing now is the increasing uncertainty over the ability of the Chinese authorities to manage the transition in China," said Angel Ubide, Peterson Institute for International Economics economist. The failed market interventions, he said, have only increased questions "about whether the Chinese authorities are really on top of things." Already amid worries about China and other emerging economies, the International Monetary Fund in July cut its 2015 growth forecast for the year to 3.3 percent from 3.5 percent predicted just three months earlier. Charles Collyns, chief economist at the International Institute of Finance in Washington, noted that "there are enduring factors that do imply a more enduring impact on the global economy. "I don't think you can just shrug your shoulders and say, 'don't worry, come back in two weeks.. "There is a broader malaise across emerging markets," he said, pointing to political crises in Brazil and Turkey, stalled reforms in India, the impact of sanctions on Russia, and the loss of income in oil exporters like Nigeria as a result of tanking crude prices. Even so, Collyns and others were quick to dismiss the suggestion of another global financial crisis in the air. After the 1997 Asian upheaval, emerging economies freed up their currencies and capital markets, and their companies stopped depending excessively on what were once cheap dollar loans. "Back then, the whole house of cards came down. But today, with no pegs, the exchange rates are able to take some of the local heat, like a safety valve," said Song Seng Wun, an economist with CIMB Private Banking. As for Japan, Europe and the United States, the sources of the 2008 crisis , the banks have gone through rigorous reforms and recapitalization that leave them far more able to handle upheavals. Central banks in all three remain on crisis footing, holding interest rates close to zero and, in Japan and Europe, still pumping liquidity into their economies to bolster growth. Since 2008, trillions of dollars in their respective currencies have been injected into economies to shore up banks and spur spending, investment and job creation. "We've long felt that the only thing preventing another financial crisis has been extraordinary central bank liquidity and general interventions from the global authorities which we still expect to continue for a long while yet," Deutsche Bank head of fundamental credit strategy Jim Reid said in a note to clients. The support could easily continue if growth slows further. Tokyo and Frankfurt could expand their quantitative easing programs, Beijing could add to growth support and the Federal Reserve could easily put off a planned interest rate hike. Ubide argued that any talk of fresh central bank action outside of China is premature. "It looks scary, no question. But this is when central banks have to show their steady hand and keep calm," Ubide said. "What they should do is wait to see how long this lasts, what the situation is in two or three weeks, and then react."